Traffic Travis is another excellent keyword and SEO research tool that works similarly to Market Samurai. Its lead developer, Mark Ling has managed to put together a superb suite of tools that will aid you with your Market Research, SEO and PPC campaigns. The great thing about this suite is the fact that it comes in two types of subscriptions: free and paid. So if you simply wish to test the SEO waters you can use the free version. For the PRO version you will have to pay 5 dollars for the trial version, and two easy payments of 47$ if you wish to continue using it. Many marketers have left positive testimonials; some of them actually call it the best tool for Internet marketing strategies, because it makes great use of webmaster tools. The interface is extremely attractive and user friendly, and it is equipped with a simple set of tools. Each tool is accompanied by a set of tutorials and guides which will help make things clearer. In other words, you will be able to make the most out of your experience with Traffic Travis while also brushing up on your PPC and SEO knowledge. What makes Traffic Travis better than the rest of its competitors is the fact that it is an all in one tool, and this is just the tip of the iceberg. Let’s take a look at its fundamental features. As I said before, Traffic Travis is the perfect tool for both do-it-yourself webmasters and specialized companies, because it benefits from a healthy range of competitive analysis and keyword research tools (Traffic Travis actually refers to itself as the insider’s look at SEO without the hassle of having to learn it). In order to gain a profit in the future, you absolutely have to choose a profitable keyword. This means that you will have to learn more about the competition for the phrase or keyword, the CPC score etc. The Quick competition research tool will immediately tell you if a keyword is worth pursuing or not, according to different metrics. If you were to check this manually it would probably take a few hours. All you have to do is to type the desired keyword in the search box, and Traffic Travis will return 200 hundred results for the free version, and 3000 for the PRO version. From here on you can play with different filters, or arrange them according to different criteria. External benchmarking, and “spying” on your competition is part of your job description. It is always good to keep a close eye on how your next-door neighbor is doing, and Traffic Travis will make sure that you can do this with only the click of a button. You will be able to discover competitor’s backlinks by pagerank, anchor text, and other metrics. This is extremely important because it will give you powerful guest posting resources for link placing. SEO is a complex and extremely complicated field, and people who are new to it will definitely need a lot of help in order to become successful. Traffic Travis will make it easier for you to understand the on-page SEO metrics with the help of a strong rating system. You will soon know what you did wrong, and what you did well, and over time you will be able to perfect your efforts. How is your site performing from a SEO point of view? You will find out via Traffic Travis’s dashboard. Everything from Alexa traffic rank, indexed pages on Google, Bing or Yahoo, what your top 5 pages are and many more interesting data will be deliver to you in the blink of an eye. Similar to the Links to Competitors tool, this tool will enable you to monitor your competition. In other words, you will be informed what keywords your competitors are paying to advertise on (keywords which are paid are usually very profitable). This will save you from the trouble of having to experiment with keywords, simplify your PPC efforts and save you important time and money. This feature will also help you to spy on your competitors and find out what methods they are using in order to rank better on SERPs. What type of optimization tactics have they applied, where did they place their backlinks, which directories they have submitted to etc. Traffic Travis will analyze the top sites according to the selected keywords and show you how you can improve your own ranking. They are displayed according to the following columns: PageRank, Age, BL (backlinks on page), BLS (backlinks on site), TBL (total backlinks). The next attributes are displayed with the help of a tick or cross and they are: DMOZ (DMOZ directory), YAHD (Yahoo Directory), Title (keyword in page title) H1 tag, DESC (keyword in page description). Among its many features, TT also offers comprehensive reports (graphs and diagrams) that will help you explain the SEO language to non-believers and clients. In addition to this, graphs will show you all you need to know in order to advance in rankings. The Most Winning Keywords feature is one of Traffic Travis’s secret weapons, and it will help you figure out which keywords are most profitable, winning and lucrative. 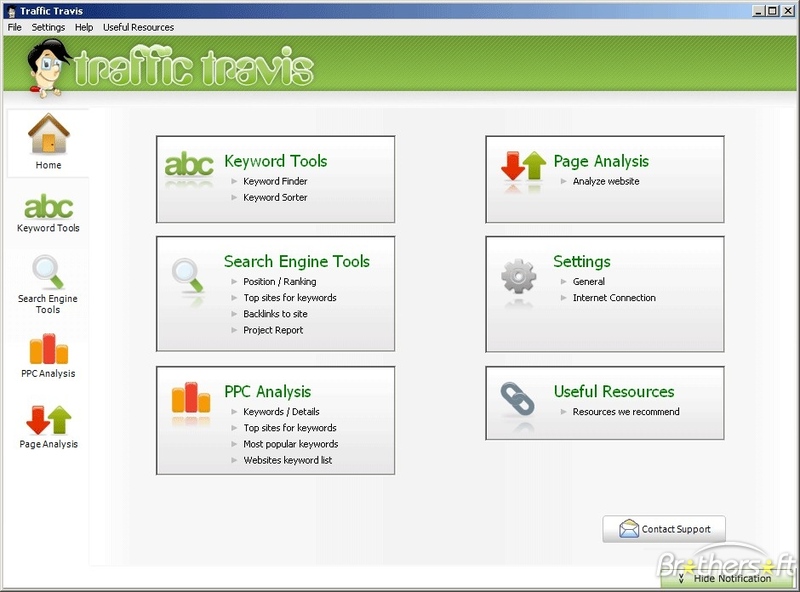 Useful Tutorials for Understanding Traffic Travis:Traffic Travis is one of the best tools for competitive analysis, keyword research and PPC campaigns. The free version is 200% risk-free, and it will definitely help you improve your rankings on SERPs.